TAKAYUKI MIKAMI 9th Dan JKA. Interview By Seamus O’Dowd. DEVELOPING PERSONAL AWARENESS (PART TWO). By Peter Consterdine. SPINNING PLATES. By Paul Mitchell. TO SEARCH FOR THE OLD, IS TO UNDERSTAND THE NEW. By Dorian Fretwell. CONVERSATIONAL KATA. By Mike Clarke. SHU-HA-RI REVISITED. By Scott Langley. CHALLENGED YOUTH. By Ron Breines. I’ve just realised as I started writing this editorial that it’s 30 years this month (November) since I first published SKM (November 1984), WOW! I think it’s quite incredible for such a specialised magazine to keep going for so long, but as I’ve said before it’s a labour of love. I still enjoy preparing the magazine and choosing the balance of various articles. Someone else will have to take over if we keep going for another 30 years, I’ll probably be six feet under!! Also, on this 30th anniversary I want to take this opportunity to thank all the SKM Advertisers without whom the magazine would not be able to exist, thank you to all of them. 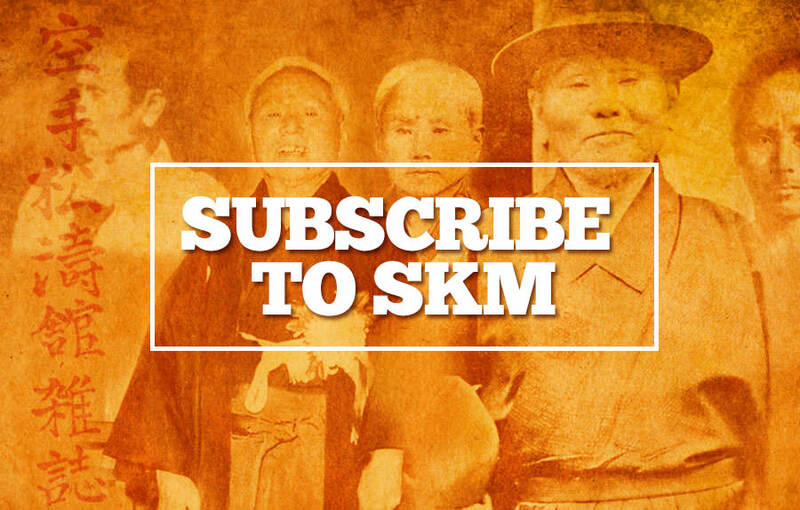 I’m sure you agree that we don’t advertise junk in SKM and never have done. Hopefully it’s all useful material for SKM readers. It’s amazing that Shotokan, as most of us practice it, has not really changed much over the last 60 years. The basic techniques are still the same using the same principles, the dojo etiquette is still in place in most traditional dojo, the standard 26 Shotokan kata are all still practiced, studied and analysed, the system of the 3K’s; kihon, kata and kumite is unchanged. It speaks volumes for the legacy left by Gichin Funakoshi and all those masters who have followed him and long may it continue. We (Shotokan) have our critics but Shotokan appears to be going as strong as ever in many different countries around the world and there has to be a reason for this, we must be doing something right! The main feature in this edition, is the second part of an interview with Takayuki Mikami sensei 9th Dan JKA. The first part of this interview appeared in Issue 107 (April 2011). I have to say a huge thank you to Seamus O’Dowd 5th Dan SKIF (based in Co Meath, Rep of Ireland) for conducting both of the interviews. Seamus has been a great friend and supporter of SKM for many years. And also a very big thank you to Joey Giluso 5th Dan JKA, a student of Mikami sensei for the past 30 years, for arranging the latest photo’s of Mikami sensei, taken by Stewart Shields to go with this second interview. Mikami sensei was born in 1933 making him a marvellous 81 years young and as you can see by the photo’s, he’s still training and teaching at his dojo in New Orléans. He’s an inspiration to all of us. I always remember Mikami sensei on the old JKA movie films, demonstrating kata and tsuki waza, when he must have been in his early twenties. We’ve recently had courses here in England by various Shotokan senseis who are based in the USA, e.g. Steve Ubl, Richard Amos and Rick Hotton. I’ve heard great reports from people who attended their seminars. We‘ve had an interview with Richard Amos in a previous edition, and he’s written several articles for SKM. Hopefully in the future we can get interviews with senseis Ubl and Hotton. Author, Sensei Paul Mitchell 5th Dan. Growing up in the 1960s and 70s entertainment was not what it is today. It was often quite funny, often sexist, racist and just about every “ist” that you could imagine. There was one thing it was not and that was sophisticated. If Britain had talent, certainly on the relatively trivial level of entertainment, it was not all that apparent. I remember as a child watching a talent show on television and the act was somebody spinning plates on the top of poles. The idea was for the performer to move from plate to plate keeping them all in motion so none fell to the floor. The next part of the act was to get a member of the audience out on to the stage to attempt to replicate this scenario. Obviously this did not go well for the audience member. I know this is not that funny as I stated entertainment was not all that sophisticated in those times. However this fairly common stage act gave rise to a probably not so common saying in recent years and that saying is that ‘life is like spinning plates’. The idea behind this saying is fairly obvious. We as individuals tend to have busy lives, and are in constant motion in order to keep every component of our lives on top of metaphorical poles so they don’t come crashing to the floor. The study of Shotokan Karatedo is for me like spinning plates. If we do not keep each integral part (plate) in motion, in other words if we develop a bias for one, the others ‘crash and burn’ and our training goes out of balance and therefore our personal development as a martial artist suffers. I have listed below 10 of my metaphorical plates or components that make up what I consider to be a fairly rounded study of Shotokan Karatedo. The list is just a generalisation and I am sure that many karateka would wish to add to it. I have left the sporting aspect of our system off my list. This may indeed be a bias on my part but my contention is that by its very nature, sports karate causes imbalance in the students and certainly in our culture (British) causes them to mistake sporting ethics for Budo. Kyshu (vital point) knowledge and ability. Realistic understanding of and ability with kata Bunkai. Ability at all ranges of combat. Compassion for your fellow man. The idea of a plate works quite nicely on another level as by the use and nature of a plate it has the ability to hold or contain. Each integral part of our system on my numbered list has sub issues or reasons why they are essential for our personal development as a martial artist. These sub issues contained in our ever spinning plates are in my opinion something like this. Physical structure – Health, fitness, balance, alignments, strength. Kata internalisation – Learning the kata form from a good source, daily practice. Martial ability – Overriding discomfort and pain, developing the ability to defend oneself. Meditation – Developing the ability to empty the mind of preconceptions and distractions, fostering a peaceful mind in your daily life. Kyshu knowledge and ability- Knowledge of vulnerable (vital) points on the human body, and the ability to make use of this knowledge in combat. Historical perspective – Having knowledge of our roots, the ability to understand where the past masters were coming from in terms of the arena that they were fighting in. Realistic understanding and ability in terms of kata Bunkai - Having the mental freedom to rise above the often taught unrealistic interpretations of the moves and principles contained within our kata. To continually delve deeper into realistic interpretations. Ability at all ranges of combat – To develop the ability to fight at long, middle and close range. Continual spiritual development – This is a difficult subject to write about. It is obviously a fair way into our training that we encounter such ideas, but ironically it seems to me that it relates very much to the issue of keeping a beginners mind. In this way we remain at the start of our journey. Never becoming cynical and arrogant and as such our development eventually becomes one of a spiritual nature. Compassion for our fellow men – My tenth plate contains the fruition of the seeds of all the others. When I started out on my karate journey, I like many others just wanted to learn to fight. When I started teaching I had the vision of a dojo full of tough street wise mostly men, developing into fighting machines. Teaching children and people with specific needs was a chore. Over the years and decades I have come to realise that our way of the empty hand, our way of honesty and decency is for all people, and the more the individual needs it the more we as teachers must endeavour to help them on their journey. We can see how the overemphasis on one aspect of our training will have a detrimental effect on the whole. On several occasions over the years karateka from other schools have visited my classes, and I have been quite impressed with their knowledge of Kyshu ( vital) points, only to discover that their ability to perform well structured Kihon (basic movements) was somewhat lacking. Obviously their training will not lead them anywhere of much value. A detailed study of kyshu jutsu, or the ability to strike meridian points in order to defeat an enemy or enemies is a complete study. For the full time student it may just be possible to incorporate all 400 plus points; however for the part time trainee this seems unrealistic. As with all things within my training I try to follow Sensei Funakoshi’s lead, in his master work Karate Do Kyohan he listed 40 vital points. This would seem a reasonable study for an average karateka to me. Eventually karateka that overemphasise the theoretical aspect of their training would not only not be able to access these vital points in any form of combat but also their fitness levels will suffer. My personal experience is that bodyweight often becomes an issue for these people. There is a tendency in our modern times, in some quarters to make martial art training more about physical fitness than martial competence. Whilst it is obviously necessary for all karateka to strive for good levels of personal fitness an overemphasis on purely physical power and prowess without due consideration of the mind within our training is again an imbalance. Most certainly the opposite is also true. I think that Bruce Lee’s statement that wood cannot hit back has been well overused, but none the less is true. The overly physical karateka may be able to hit the heavy bag seriously hard, but without due consideration of our potential attacker’s mindset this ability has its limits. Conversely to over consider tactics, without the ability to finish the job at hand is most certainly a mistake. We can see from this how our martial art is designed to balance us as individuals, to be a thinker and a doer has its obvious advantages in our daily lives. Meditation within martial arts is often a contentious issue; obviously it should be there otherwise why, as Shotokan karatedo-ka do we perform it at the start and finish of our every training session? The Chinese say that the mind of a human being whilst not successfully quietening it with meditation is a monkey mind, personally I love this description. To me it works on two levels, firstly the vision of our minds jumping uncontrollably around as if a monkey from tree to tree is I think how our minds are when we first start to sit or kneel in meditation. The idea of the monkey mind also works for me as a reminder that our training is designed to both bring us back to nature, and also to elevate us above mere animal instincts and impulses. On a very fundamental level I explain to my novice students that, we cannot do anything properly until we can do nothing properly. We could say that the other side of the coin to meditation is the content of my third plate, being martial ability. Why if our eventual goal is compassion is the ability to defend ourselves of such paramount importance? I may have my critics, but no one could say I fight shy from an issue. The Shaolin monk tradition obviously felt that these two apparent opposites were compatible, or maybe even as I believe essential partners. A person may claim to be a pacifist. As I typed this word I noticed that the second part of it is fist. Nearly makes my point for me. Can one really choose peace when they are not able to deal with the opposite situation? Or are they constantly in a state of insecurity. Insecurity breeds aggression, so pacifists without the ability to defend themselves mask an aggressive inner nature. It is as we start to suspect as we get into our karate, the real enemy is within, and the person that we are trying to defeat is us. So in conclusion on the subject of martial ability and compassion it seems to me that the inner strength gained by decades of blood sweat and tears that must be endured in order to learn the skills of combat are an essential ingredient. Before we pacify the fist we must first train it. In the west we tend maybe because of the nature of our medical view of the human form to not consider ourselves holistically. This is not true in eastern culture. It has often been implied that Sensei Funakoshi was more of an educator than a martial artist, that he was more interested in the development of the whole person than just their ability to fight. In order to teach a person to defend themselves at the right time and with the appropriate force we have to get to their inner nature. In short to not consider ourselves holistically within our training is ludicrous. It seems to me that this is the secret behind sensei Funakoshi’s karate. It is a body, mind and spirit system, and as such each integral part must be visited on a regular basis. Oh well that is enough writing, I am going back out to my spot in a field (same one for 25 years) and spin some plates. Paul Mitchell holds a 5th dan in Shotokan Karate. A senior instructor for the TSKA and also is a grade A teacher with the Tai chi union of Great Britain. He is a leading instructor within Lotus Nei Gong Taoist Arts. Paul is also a qualified Qigong therapist.